A friend gave me this flower ring and necklace, when she handed them to me I thought they were porcelain–there’s a very vintage feel to them. From a distance you really can’t tell that they’re made out of rick rack! Yes, rick rack! She shared how to make them with me, and now I’m sharing with all of you readers! The wow of the rosette comes from a few simple steps! She found this tutorial, in Portuguese I believe. First, cut 2 strips of rick rack. She said that the medium sized rick rack works the best–so that’s what I’ve used. No need to find out for myself, I’m taking her word for it. I cut the rick rack 10-12″, depending on how big of a flower I want to end up with. Then twist the two pieces of rick rack together, like this. 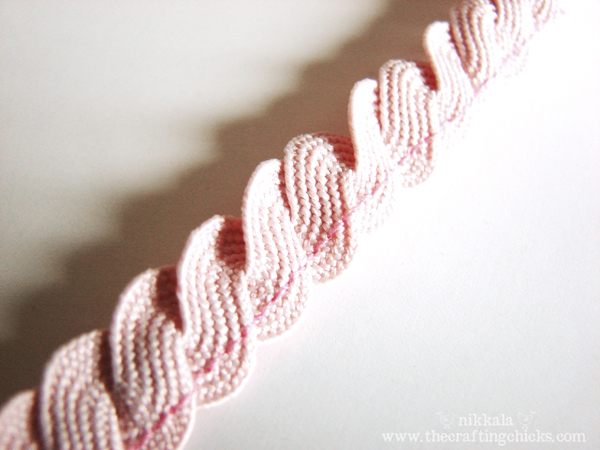 And then run a stitch down one side to hold it all together. 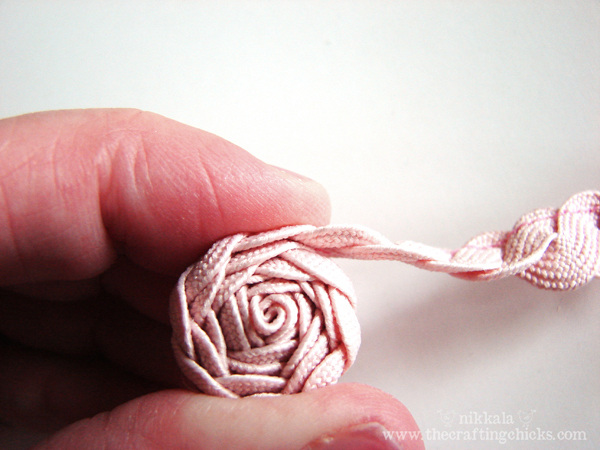 And to make the flower, you just start from one end and roll it up. I add small dots of hot glue, just to keep it all together. Until you have this–and then tuck the little tail under and hot glue it down. I also glue a small circle of felt or fleece on the back, just to finish it off. 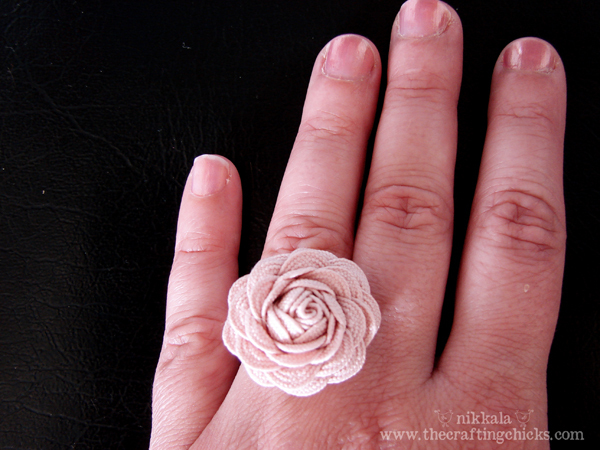 To make your flower wearable glue it on a ring blank, a necklace, or on clips for little girl’s hair. Can you think of other fun places to put these rosettes? You’ll notice all of the petals are closed, so to open them up you just peel them back one by one. Until it looks like a flower. As you wear it, the petals tend to close up, so re-opening it will be necessary. Unless you prefer it closed of course. And here it is on my finger. A totally crafty cocktail ring. There are so many flower tutorials out there, and this is a great one! Ric rac, who would have guessed? Thanks for the tutorial!! Just ANOTHER reason why I need a sewing machine! LOL! I love it! 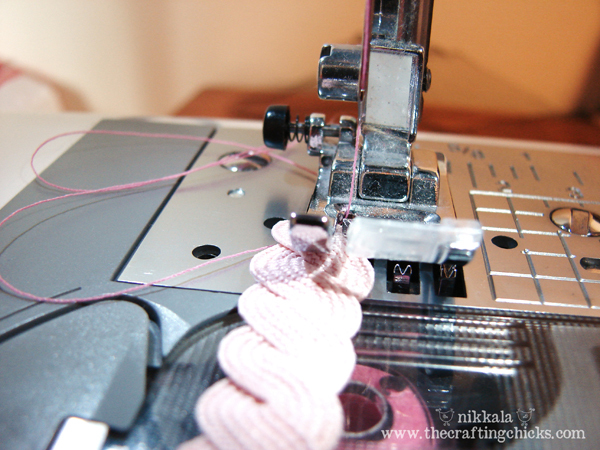 You could hand stitch it…but if it is the final push to get a sewing machine forget I ever mentioned it! Nikkala! That is the coolest thing ever! I totally love it and want to buy ric rac in every color now. Great tutorial! This is so cool!! Thanks for the great idea! OH MY WORD ALIVE. So cute Nik, you are one naughty crafty cat!! Love it!! Nikkala! This takes the CAKE! LOVE this! How unique and fun! I’ll be featuring it on my blog at the end of the month – all credit linked back here! Thank you so much for these directions. I saw these made up someplace and purchased my ric rac yesterday wondering if I’d get it together right. Well thanks to you I can practice correctly. Love this! Can’t wait to make some cute hair barrettes for my daughter using this method. They would make a great bouquet if you could wire them up in some way? Maybe hold the wire in the center before you start twisting? I am thinking cute Mother’s Day rosette bouquet! A bouquet would be so cute…I’ll have to play around with that idea! These are fantastic! Thanks so much for sharing the tutorial! LOVE THIS! Thank you so much for sharing the tutorial! Oh my!! Totally lovin’ it! So very cute! I am going to have to try these with my bags of ric rac… I inherited my granny’s collection and have tons of it! Lucky! 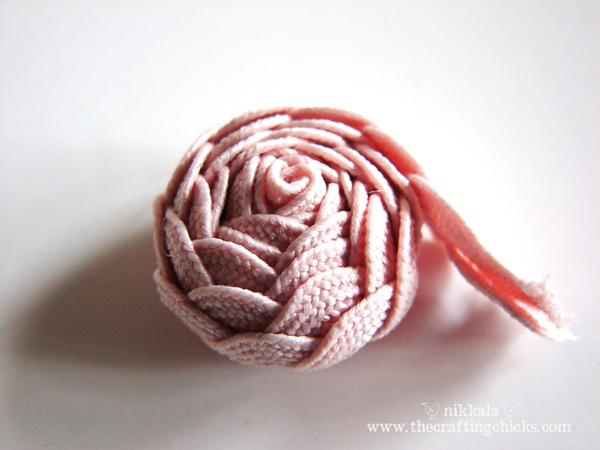 You can make roses for everyone you know! This is sooo creative and fun. May have to try it out for myself!! OMG thoes are awesome!!! Thank you so much! OMG those are awesome!!! Thank you so much! those are fun! i like the idea of a bouquet for mother’s day…totally going to try it! Awesome idea! I love it! I was just wondering how you made it into the ring. What you used on the back to be able to wear it. Thanks! Hydi, I found ring blanks in the jewelry section at Hobby Lobby. The official name is ‘ring with pad’. It’s a ring with a flat round disc on top. Oh my word – love everything about these! Talk about a great gift idea! rockin’ tutorial! I need to give these a go. so cute, I must try this. I’d really like to see a better picture of the necklace though. These are so cool, thank you for the great idea! Love this idea! However where did you find your blank rings to mount them on? I found them in the jewelry section at Hobby Lobby. It’s called a “ring with pad”. Hope that helps! This is so cute! Can’t wait to try to make one too. preciouse little idea! rick rack – to top it off!! thanks so much for sharing. That looks like a very quick and easy way to make frog closures as well! wow really cool! you could starch it to keep it open forever, and i would try using two different shades of red. brilliant little ring. Love your rick rack flowers, was about to make some myself and didn’t know about the trick of combining two strips together for a totally different look! Thanks so much for sharing and would love to see on at my international crafty linking party, Craft Schooling Sunday, which opens Saturday (night for me, day maybe for you) and is open atleast until Wednesday. Hope to see you there! 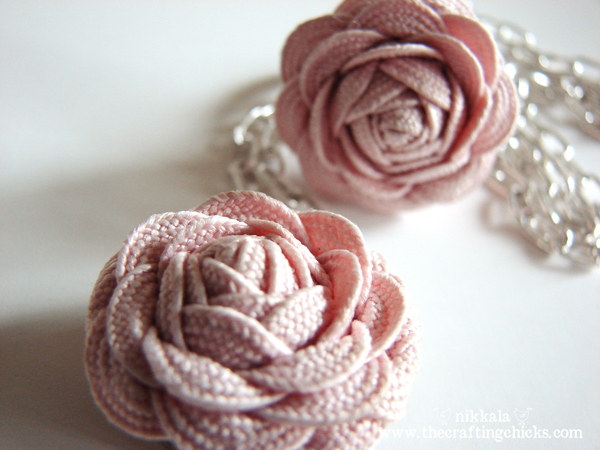 I have seen many, MANY flower tutorials using fabric scraps, t-shirts, etc…but these are simple and beautiful! Wonderful ideas..thanks so much for the clear instructions and the lovely little flowers. I’m going to run out and buy rick rack.. This is adorable!!! Just love it!!! Thank you! Wow. These are awesome! Thank you for sharing!!! I can not wait to try this out. Thanks for a great tut. I hate rick rack… but I LOVE this! Thanks for making me see rick rack in a different way. I agree! I have always HATED ric rac. This is the first time I’ve seen it used and it hasn’t made me want to run away! These are wonderful!!! So cute! 😀 Thanks for sharing the idea! Awesome!!! I can’t wait to make one! Thanks, Nikkala!! I just discovered this project from a link on Twitter – I am in love with that ring, I can’t wait to try this on my own. Thank you for sharing! 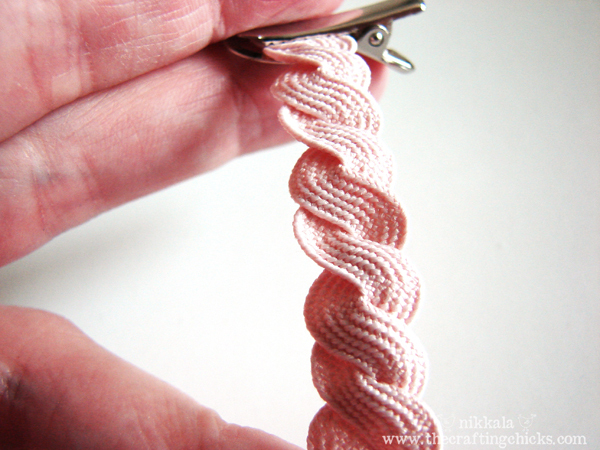 Thanks for this tutorial – it is so cute! I know how to make all kinds of rolled flowers – ribbon, fabric, etc., etc., etc., but I have to admit, this is the first time I’ve seen this one. How lovely! My mother had a pearl necklace many yrs ago with similar roses on it. Immediatley, I thought of this necklace when I came across your post. What a neat idea…..and to think with rick rack! Awesome! I have seen a lot of flower tuts, but I really like this one. I may have to make a few and make some sort of hair accessory for myself. Really pretty outcome! I think your hands are great! Reminds me of my rick rack ring tutorial. These would be great in different spring colors on a wreath mixed with other fabric flowers. Great tutorial!!! Thank you for sharing this tut! I am going to make these and glue them to my ugly hair clips. They are the only things that hold my hair, but ewwww, very ugly! I know this will dress them right up! I am glad I found you! What a cute idea! I can’t wait to try this. I think I’m going to make some and sew them on throw pillows or maybe stitch to a knitted scarf. Thanks so much for the GREAT tutorial. It’s so easy to follow. I can’t wait to make some of these for myself. Beverly, your pillows are so stinking cute! Thanks for linking back. I went ahead and shared them on Facebook and Twitter. Love them! These roses are the cutest and sweetest things I have seen! Thanks for sharing! These are absolutely fabulous, I love them and can’t wait to have a try at making them. 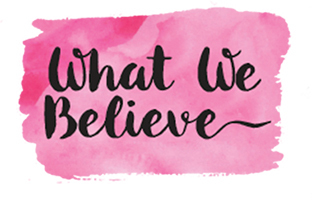 I have put a link on my blog because they are the my favourite thing I’ve come across this week! I love this! Although it uses a sewing machine and I am not lucky enough to have one. Any suggestions on how to do it without one? Love these though! Muchas gracias y un besito desde Barcelona ! cute idea! think hot glue or glue dots would work instead? Ok I officially love this but I have a question… What can I use or how can I wrap this to make it stay semi open, such as on your ring? I am planning on a few of these as decorations on a display but I don’t want to have to continually reopen them? This is so cute! I just made this and hot glued it to a ring I had. The only problem I had was that the finished product was really bulky and kind of heavy. But that’s a small price to pay for something so cute. Your hands look like your model was wasted money!! Thank you for such a great idea. I just love this and will begin testing it immediately. I detest those natty mini roses from WalMart. These will work much, much better. I think a twist of green on each side will make leaves. These are gorgeous! Thanks for sharing such a clear tutorial! I have extra ric rac and am going to try attaching it to a bobby pin and making a clip for my daughters!! Love it, thanks! Isn’t there a product that is kinda like Mod Podge but makes fabric flowers look like porcelain when dipped in the product? I wonder how these would look like that? I think that they would look great on a headband too. Yes, I just learned about it. It’s called Utee! That’s a wonderful idea! I absolutely love it! Thank you for sharing it with us! Oooooh! I love these. I can’t wait to try this out. P.S. Your hands aren’t any worse than mine. we did something similar, but i’d like to try this one as well! My son is getting married next month and the wedding has a “vintage” theme. We are having the rehearsal dinner at a beach house – I think I will make many of these in the wedding colors and scatter them on the tables etc. These are adorable! Quelle belle idée, je pense que je vais m’en servir! Merci! It’s a very good idea…the result is beautiful. 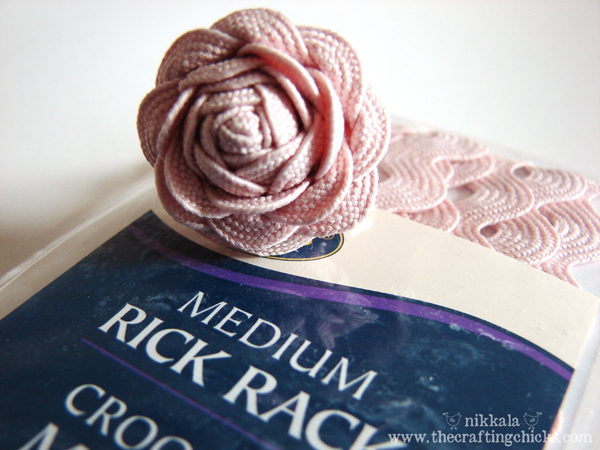 I do love your rick rack rosettes. However, I would like to print out the directions and cannot figure out how w/out printing all the extra pages of comments. Can you help me w/ that? Thanks, Cindy. I’ve been making theserosettes and attaching them to stretch lace and making them into bracelets for my daughters. They look so delicate on their cute little arms. wow..Love your clear and concise directions. 5 stars for the authors and photographers!! That is sew cute I just Stumbled upon you….and joined up..I’d like to invite you to CountryMommaCooks Link & Greet party going on now-Sunday….have a lovely weekend! hello ladies, I loved this rosette idea, but I can’t braid my rick rack 🙁 I make a mess on it every time I try to. can you please help me. I really want to do it, I bought several rick rack packs and I don’t want them to get wasted. I love this tutorial. Thank you for taking your time to share this with us. I made a red rose ring and love it. I did share a picture of my finished project and a link to your blog post. This is a lovely tutorial and the flowers are so sweet. Thank you for sharing. What a clover idea!Thanks alot! This is great. I love it. I will definetly try to make some. Thanks a lot. I really like the result of the rick rack ^_^. I think I will make a headband with this rosettes. This is great! Luv it!! I think they would dress up a plain purse or tote bag or of course, on wreaths. I’ve been making felt flowers. The scalloped edges really make these look nice. The rose is SUPERB! I might never make it as I have never seen that rick-rack in our shops, but I loved the idea. What I actually wanted to say was that you should never EVER apologize for what you are or what you have. Those hands you apologize for made this wonder! It is what they can do, not how they look like that really matters. And you should be proud of this! These are great! So easy to make…I’m making these as a part of an arrangement for my wedding decoration. Instead of going out and spending extra for a can of starch, I used hairspray that I had left over from years ago to stiffen the petals up and keep them open! Works great, I just put on a few extra layers in between dryings for extra stiffness. 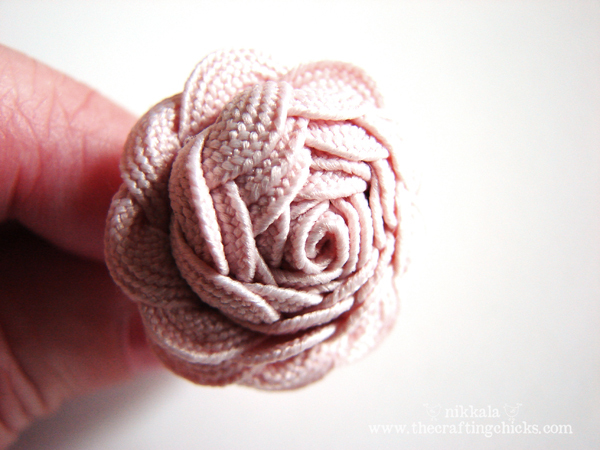 I’ve made these rickrack roses for years but didn’t think to sew one edge to keep it together just glued as I rolled. This will be far messier! Thanks! This is a beautiful idea! Thanks for sharing. It brought back memories of when I was a teanager and my brother and I used rickrack to gather one side and make earrings and even sold some. 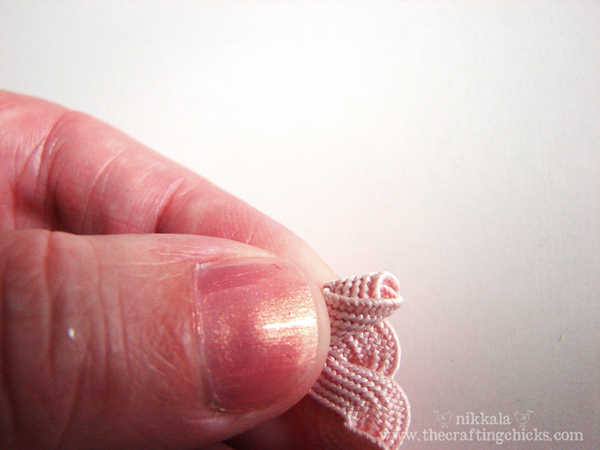 Back then you could buy the screw-on type earring backs and we would glue them on the backs of the rickrack. It would look like a cup and saucer. I cannot remember exactly how we made them but your idea is just great. I am making these in variation of shades of pink to put on a diaper cake for a baby girl! Thank you for idea. thank you so much for sharing this. I have been looking for patterns to make accessories for my suit jackets and to make for my god child who wears very classic dresses but loves glittery shoes and hair bows. I can see this used either in her hair or as a shoe decoration. If you have any other suggestions kindly forward them. I had vowed to have a flower free wedding. Until now. These are great! I’m going to do a bouquet, several rings, and several boutonnieres! Yay! i really love it..thanks for sharing..love you idea of the ring..saving this instructions for later…im going to do some for my grandgirls….. Thanks so much – I’m envisioning a grouping of three to make a lovely brooch. Thanks for sharing! Would love to see how your brooch turned out…I don’t have a sewing machine, but am going to see what I can do about working without the rick rack …. maybe I’m dreaming! LOL!